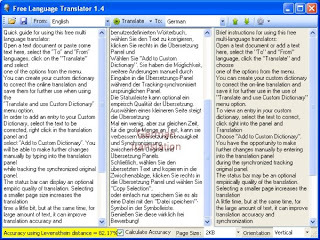 A desktop language translator application using the Google translation service. It adds more features to the existing service and addresses some of its shortcomings. Open a text document or paste some text here, select the "To" and "From" languages, click on the "Translate" and select one of the options from the menu. You can create your custom dictionary to correct the online translation and save them for further use when using the "Translate and use Custom Dictionary" menu option. In order to add an entry to your Custom Dictionary, select the text to be corrected, right click in the translation panel and select "Add to Custom Dictionary". You will be able to make further changes manually by typing into the translation panel while tracking the synchronized original panel. The status bar can display an optional empiric quality of translation. Selecting a smaller page size increases the translation time a little bit, but at the same time, for large amount of text, it can improve translation accuracy and synchronization between the original and translation panels. You can also set the orientation of the panels from the combo box on the status bar. Finally, select the translated text and copy into the clipboard, right click in the translation panel and choose "Copy Selection", or just save it as a file using the "Save File" icon in the toolbar.